While chopping out some of the multiflora rose that had introduced itself onto a new section of the farmer’s lane, I uncovered a new plant. I knew the moment I saw it, that it was one I was unfamiliar with. The briars of the thorny roses were tossed into a heap away from the little new plant. This new plant was indeed a small one. It grew from a few to several inches tall in the filtered shade under the canes of the rose bush. 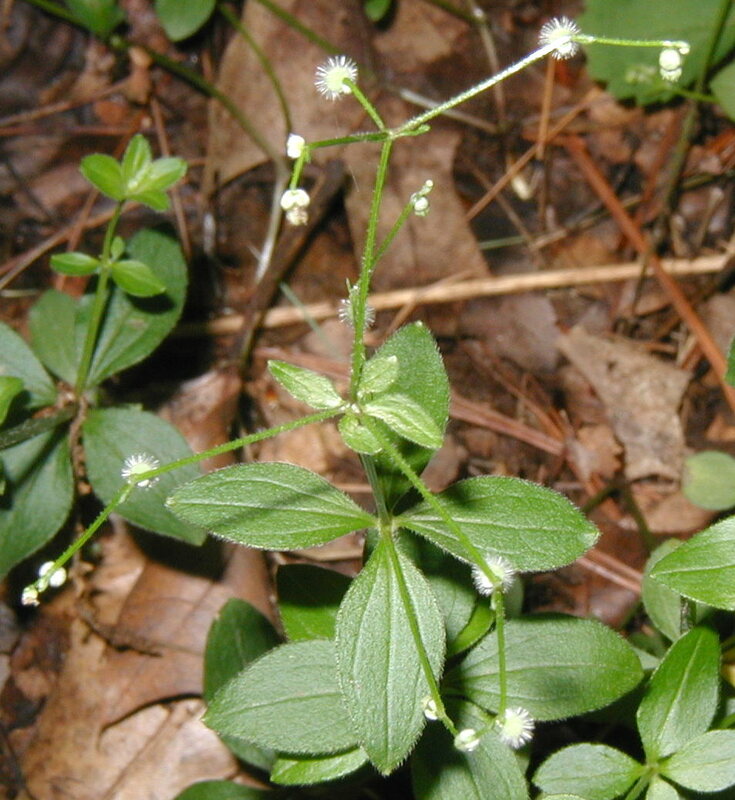 White Wild Licorice, Galium circaezans, has tiny white flowers in clusters and leaves in whorls of four. Yellow Wild Licorice, G. lanceolatum, is a similar species with yellow flowers. Wild white licorice on the south side of the farmer's lane. Photo taken 23 June 2011. Plants found growing along with white wild licorice include spotted touch-me-not, poison ivy, blackberry, elderberry and maple, among others. 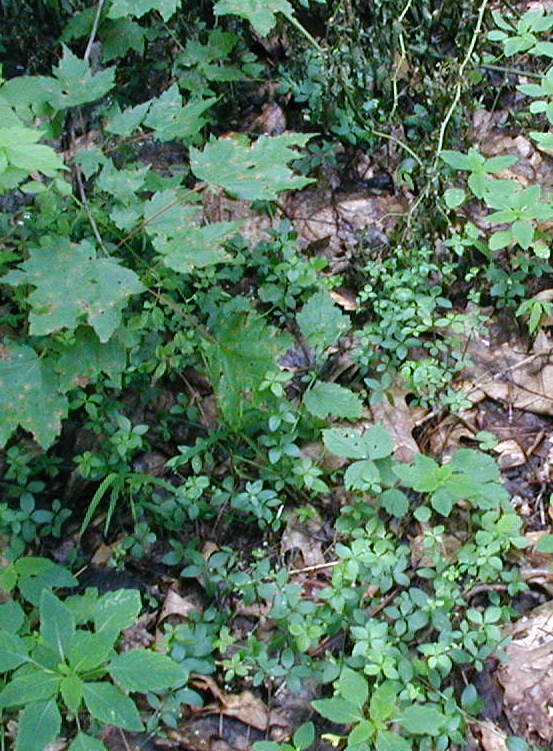 Leaves are uniform in appearance with a certain symmetry of four leaves in a whorl. Each softly hairy leaf is entire, blunt or rounded at the tips, and oval in shape. 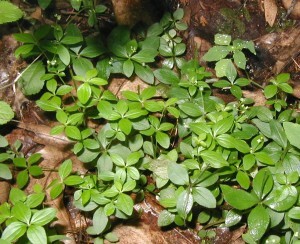 Leaves have three distinct veins and have a broad appearance. 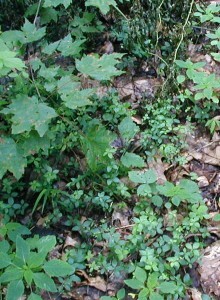 Four leaves in whorls helps to identify wild licorice. Photo taken 23 June 2011. 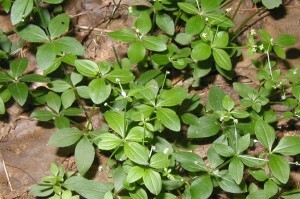 The blossoms are tiny, greenish-white flowers, each having four pointed petals. Tiny flowers of wild licorice at the tips of stems. Photo taken 23 June 2011. Wild licorice blooms over a period of a couple weeks or longer. Flowers develop into seed pods that look like little spheres with fuzzy surfaces. Cluster of tiny seed pods from flowers of wild licorice. Photo taken 23 June 2011. Leaves of wild licorice have three prominent veins. Photo taken 2 July 2011. Leaves really do taste like licorice. 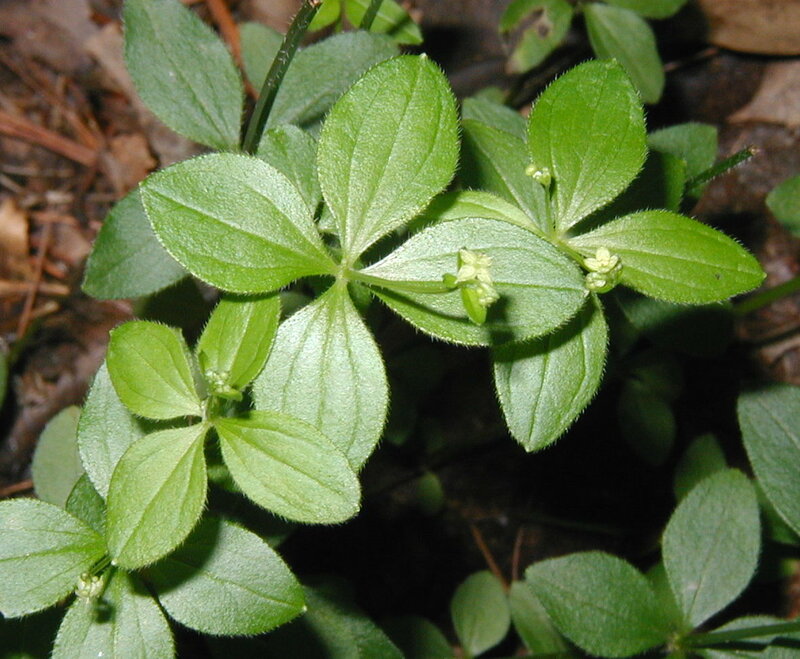 Chewing a leaf releases a cool, sweet taste that is reminiscent of stevia, but with a very pleasant aftertaste. Sometimes stevia is said to have a metallic aftertaste. Because of the licorice taste, I wonder how anyone has used wild licorice. There is no mention of G. circaezans in the Peterson medicinal or edible plant field guides . 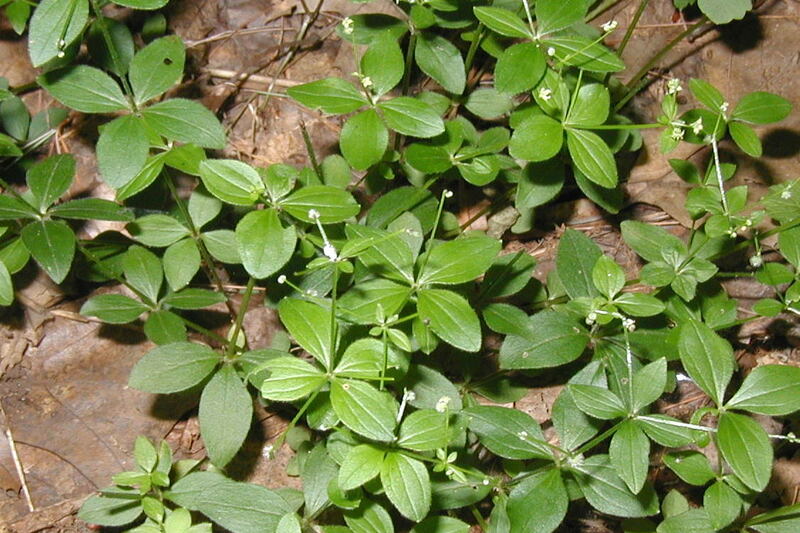 Another member of the Bedstraw (Madder) family, Rubiaceae, called Cleavers, G. aparine, is listed as having diuretic and hypotensive properties. I found some seeds online for this plant which I attempted to cultivate for the purposes of possibly using the plant in my herbal tea concoctions as a sweetner. My attempts to cultivate this in my garden met with only minimal success. When conducting additional online research to address my frustration I learned, far too late, that the plant I thought I purchased was Glycyrrhiza glabra, another plant commonly identified with licorice in flavor. Unfortunately I could not find a distributor of seeds for Glycyrrhiza glabra in the US so I resorted to attempting to grow some stevia instead. As for the Galium circaezans, I plan on composting the plant this fall and trying hard to forget this regrettable exercise in futility. The leaves may have a pleasant flavor, but my five survivors are not likely to produce enough to make harvest worth the effort. The G. circaezans is indeed a small plant and you might still be able to enjoy it in small doses. I wouldn’t compost it unless you really need the space, but that’s just me. It may spread or not, I really don’t know its habits as I’ve only found it growing wild. Love the symmetry though. I’ve grown Stevia a couple of times and it attains a much larger size so it would give you an enjoyable harvest for sweetening your teas. Personally, I didn’t like the metallic after-taste although it is surprisingly sweet! If you enjoy licorice flavor, you might take a look at anise hyssop. It reseeds nicely and will give you many more plants than you can harvest. The flowers are enjoyed by many butterflies and bees and several birds will come eat the seeds in the wintertime if the plant is allowed to stand. Good on ya’ for trying though! for herbal purposes, it would seem to me, that only real licorice will do the remedial work it is recommended for. do not expect other plants to heal the same things just because it tastes vaguely similuar. It would seem to me that taste is all in the tastebuds, but what about the actual chemicals in the food item? Wild licorice has chemicals in common with “real” licorice, so don’t you think the taste of it tells a story? Not sure about any healing properties though.